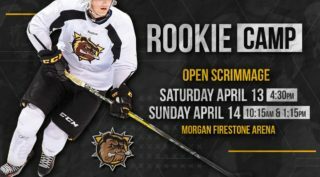 Toronto, ON – The Ontario Hockey League today announced that Hamilton Bulldogs defenceman Justin Lemcke is the 2017-18 recipient of the Mickey Renaud Captain’s Trophy. Lemcke was chosen for the award by a media selection committee as the OHL team captain that best exemplifies leadership on and off the ice, with a passion and dedication to the game of hockey and community that Mickey demonstrated. 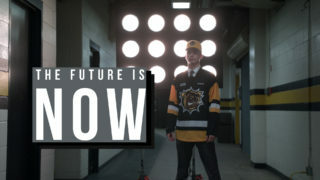 Lemcke is currently the longest serving OHL captain and was the first player given the ‘C’ in Bulldogs history appointed during their inaugural 2015-16 season upon relocation to Hamilton. In the early stages of his first season in Hamilton he suffered a severe leg break that kept him out of the lineup from early October until mid-February. He stayed in Hamilton during his recovery and maintained a leadership presence in the dressing room and throughout the community that has helped create the culture that exists within the organization today. His influence has created a welcoming environment for all players, regardless of age, to thrive both on and off the ice while ensuring his teammates are held accountable to team standards. He has embraced Bulldogs Foundation initiatives that include the city’s largest breakfast program that feeds thousands of children across 22 high needs schools, meeting and mentoring minor hockey players, and organizing team visits to McMaster’s Children’s Hospital to deliver gifts and spend time with young patients every Christmas. 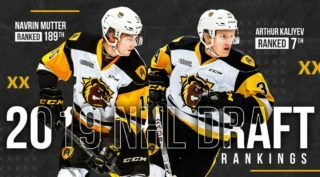 On the ice, the 21-year-old from Whitby, Ont., helped the Bulldogs steadily improve from 58 points in 2015-16, to 74 in 2016-17, and 93 in 2017-18 where they captured their first East Division title atop the Eastern Conference standings. 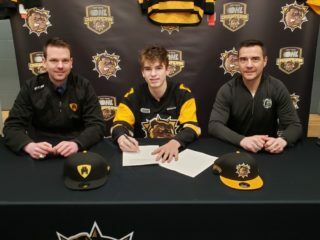 The overager was originally chosen by the Belleville Bulls in the first round of the 2013 OHL Priority Selection and has played in 258 career games amassing 105 points including 30 goals and 75 assists. This post-season he was the first to accept the Bobby Orr Trophy and hoist the Robertson Cup in team history celebrating Hamilton’s first OHL title and berth in the Mastercard Memorial Cup since 1976. Lemcke becomes the tenth recipient of the award following Alex Peters of the Flint Firebirds who received the award last season. Past recipients also include Michael Webster (Barrie Colts 2016), Max Domi (London Knights 2015), Matt Finn (Guelph Storm 2014), Colin Miller (Sault Ste. Marie Greyhounds 2013), Andrew Agozzino (Niagara IceDogs 2012), Ryan Ellis (Windsor Spitfires 2011), John Kurtz (Sudbury Wolves 2010), and Chris Terry of the Plymouth Whalers who won the inaugural award for the 2008-09 season. Nomination forms are submitted annually by OHL General Managers on behalf of their individual team captains. The selection committee consists of a panel of four, representing media from each OHL division. The Mickey Renaud Captain’s Trophy will be formally presented to Lemcke at the OHL Awards Ceremony on Wednesday June 6 at the Hockey Hall of Fame in Toronto.